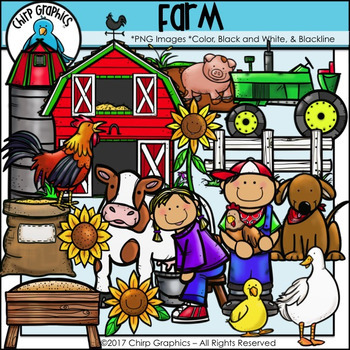 There's lots of cute country images in this Farm Clip Art set! It includes 54 png images in total - 18 colour, 18 blackline, AND 18 black and white. All possible versions to give you maximum versatility with your projects!. For a closer look at the images, please click on the Preview button. Images may not be given away freely or re-sold as clip art, classroom decor items, or colouring pages, but you may use them on your personal resources, or embed them in the teaching resources that you create to sell on TpT or TN. If you use these graphics in TpT or TN resource products, please lock down the images and provide a link to my shop in your product pages.